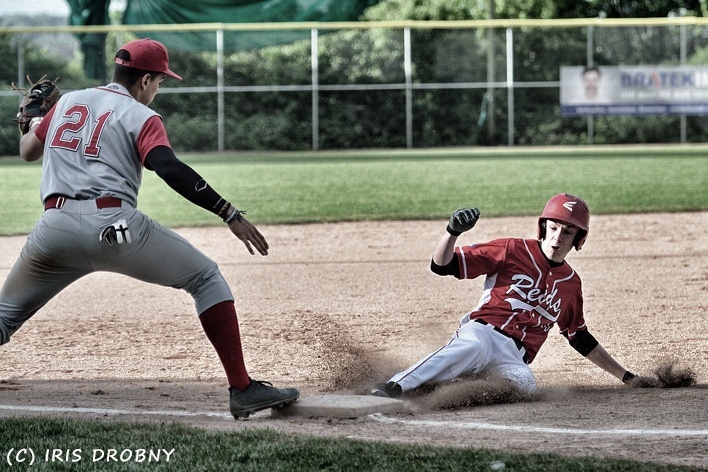 After having received a cancellation from one team just before the end of the year 2018, finally hosting Baseball Club Stuttgart REDS managed to confirm that all teams are set for the 2019 European Qualifier of PALOMINO 18U age group to be played from May 1st until May 5th. Besides host Stuttgart REDS (Germany) and last year’s winner Paris University Club (France), participating teams will be National Teams from Poland, Switzerland and Belgium, a select Team Netherlands United Baseball and club teams from Paderborn Untouchables Germany and London Mets from Great Britain. 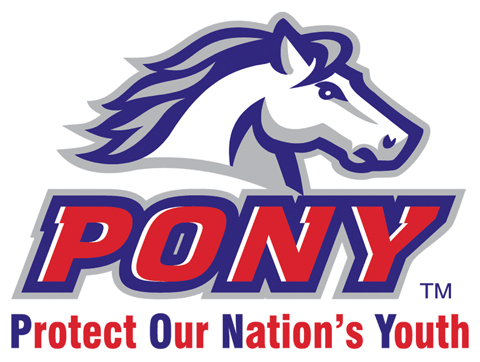 Earlier this week, during PONY’s annual Board of Directors Meeting, it was announced that the 2019 Palomino World Series in Laredo, Texas would be expanding from an eight-team tournament to a 10-team tournament. The Board decided to award one of the two new automatic qualifying bids to the PONY Palomino European Zone Champion. 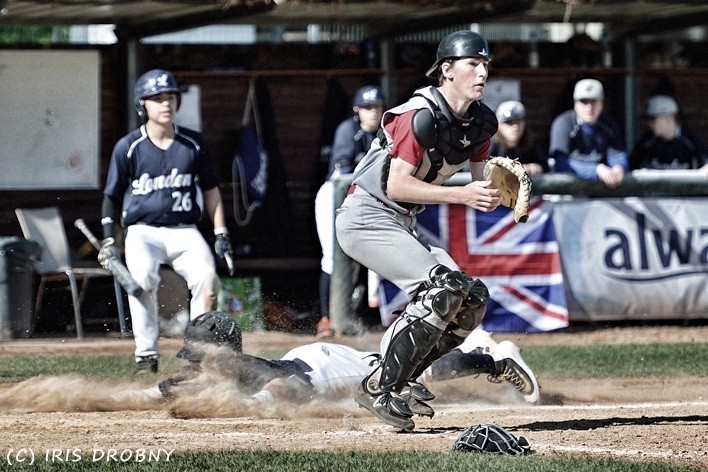 At the first ever international tournament for under-18s hosted by TV Canstatt’s baseballers, the team from Paris prevailed over both the London team and the TV Canstatt host team, the Stuttgart Reds. Top class baseball was to be seen at the DB Ballpark. 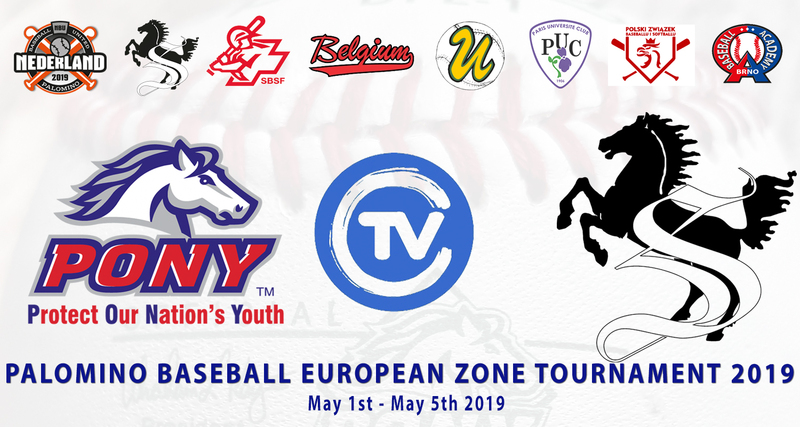 The world baseball organization PONY (Protect Our Nation’s Youth) worked with TV Canstatt to organize the U18 tournament, named ‘Palomino’. 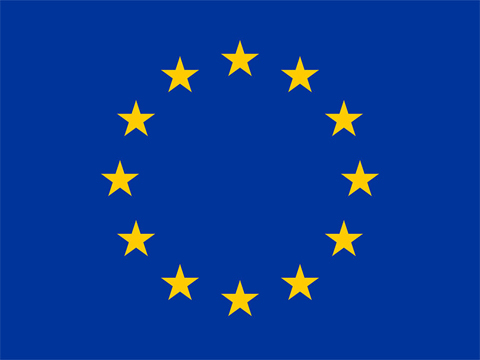 Future tournaments will serve as an open European championship, to enable teams to qualify for annual world championships to be staged in the US. This coveted opportunity isn’t yet available for the winners of this tournament. Chief organizer Andre Fink of the Stuttgart Reds, however, hopes soon to receive a positive message from Washington that Europe will gain this starting place and that TV Canstatt will be the annual host of this internationally important event. With three teams in title contention with five games remaining at the Palomino European Zone Championships in Stuttgart, Germany, every out mattered on championship Monday. 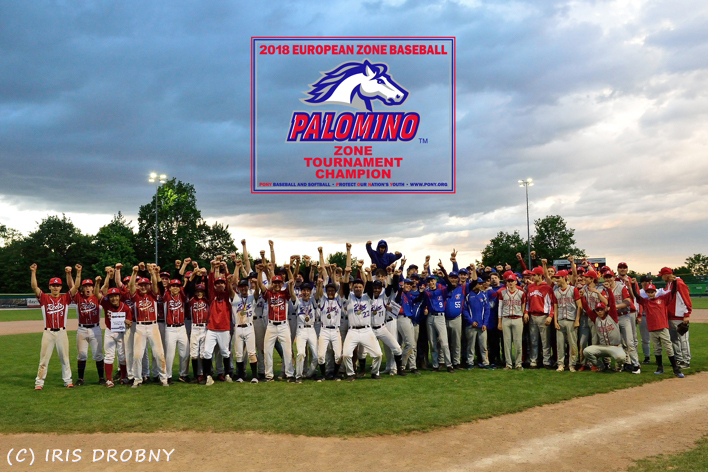 After it was all said and done, two teams (Paris University Club and the London Mets) finished with 4-1 overall tournament records, but because of Paris’s 10-7 head-to-head victory over London yesterday, the French owned the tournament tiebreaker and won their first-ever Palomino European Zone title. An eight-run bottom of the second inning, highlighted by a three-run home run by Tomoya Kakita, ignited the host Stuttgart Reds’ offense to 12 runs in the final game of the Palomino European Zone Championships, as they won 12-5 over the Swiss National Team. The victory gave the Reds the head-to-head tiebreaker over the Swiss for the tournament’s third place. The loss gave Paris University Club the title, because of its head-to-head victory over the London Mets Sunday. The Swiss got off to a hot start in the game’s first inning, scoring runs on a Sven Ambhl ground out, a Luka Ivanisevic RBI single and a Jonah Schaller RBI double (3-0). The bottom of the second is when Stuttgart really took control of the game’s momentum. 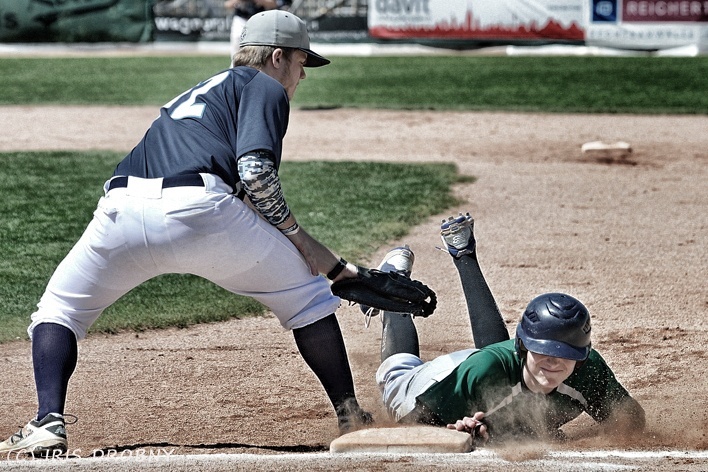 An eight-run top of the first inning propelled Paris University Club to victory 14-3 over Brabant United Monday afternoon, as the French were able to take advantage of eight Brabant United errors in the game as well. In the top of the first, Paris used five hits (two for extra bases), three Brabant United errors and two walks to score its eight runs. Erwan Prieur, Kevin Khemache, Jules Diego Rabearivelo, Arthur Dionnet and Phillip Bird all picked up RBIs in the inning. Brabant United got a run back in the bottom of the first, when Ties Olijslagers doubled home Tobias Van Schooneveld to make it 8-1 Paris. London used 17 hits to tally 17 runs in the team’s decisive victory Monday afternoon over the East Europe All-Stars 17-1 in four innings, thanks in part to a nine-run rally in the bottom of the fourth. Six players recorded multiple hits and multiple RBI in the game for the Mets. Freddy Mosier was a perfect 3-for-3 with a triple, double, three RBI and four runs scored, while leading the team with six total bases. Joe Perez was also perfect, going 4-for-4 with two RBI and three runs scored. 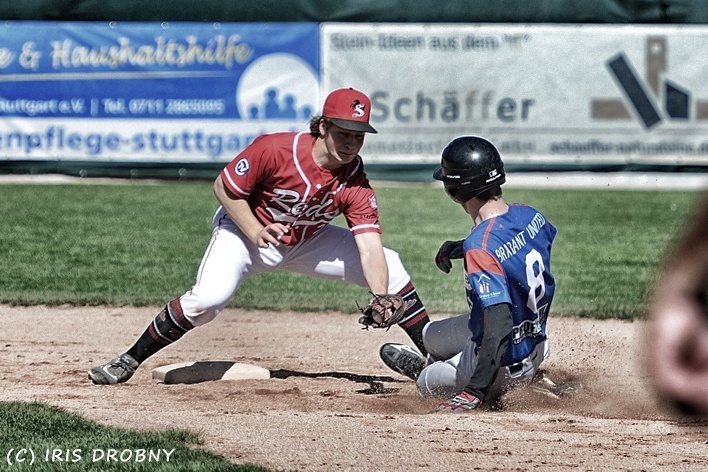 The host Stuttgart Reds struck early and never allowed their opponent Brabant United to extend a rally in their 11-3 victory Monday morning. The Reds shot out to a four-run lead in the top of the first, when Jonas Van Bergen led off the game with a double and Fabi Beck drove him in on a single to right field. Benedikt Schaffer walked. Two at-bats later, Beck and Schaffer stole. Beck came around to score on the overthrow and Schaffer took third. Amando Dossow singled in Schaffer and Dossow later scored from second on a fielder’s choice play to complete the scoring for the inning. 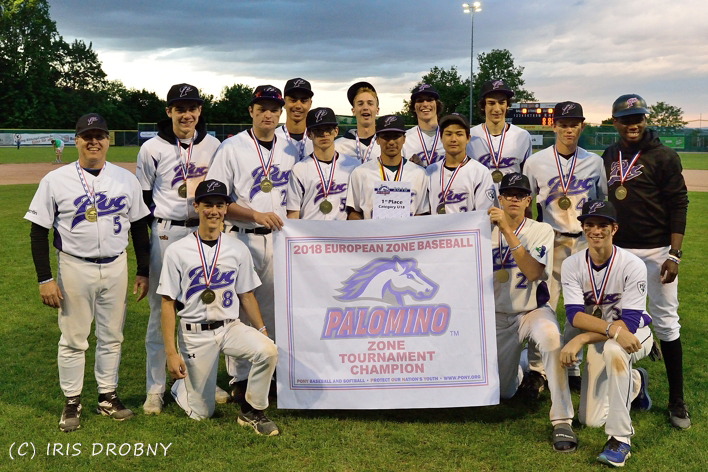 The London Mets’ Joe Perez came through in the clutch for his team in the sixth inning of a one-run game against the previously-undefeated Swiss National Team to start day four at the Palomino European Zone Championships in Stuttgart, Germany. With runners on second and third with no outs, down 4-3, Perez chopped a ball up the middle for a single that was hit hard enough to get through the infield but soft enough to slow down in the outfield grass, allowing both Aidan Pearce and Freddy Mosier to score and give London a 5-4 lead. Paris University Club won an exciting marathon of a game that lasted late into Sunday night 15-13 over the East Europe All-Stars and stayed in title contention. 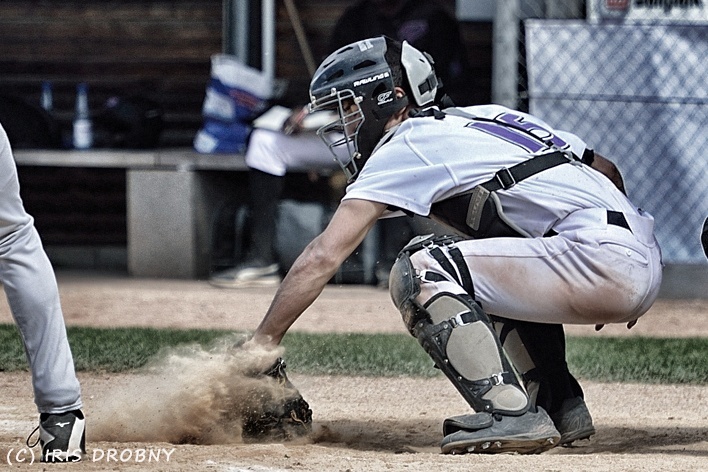 Both teams combined to score 21 of the game’s 28 runs in the final two innings, after East Europe tied the game at seven by the end of the sixth inning. In the top of the sixth with two outs, Paris loaded the bases thanks to Ewan Hauser reaching on an error, a Jules Diego Rabearivelo walk and a Paul Stukas single. Samy Jamous reached on an error on a fly ball to left field, scoring Hauser, before Pierre Monbeig singled to center field, making it a 7-3 game.